← How to convert files of AutoCAD to pbm? How to convert files of AutoCAD to mng? The interpretation to MNG format file. MNG is an extension of the .PNG image format that uses indexed colors and supports image animations; similar to an animated .GIF file, but uses higher compression and features full alpha support (multi-level transparency).The structure of MNG files is essentially the same as that of PNG files, differing only in the slightly different signature and the use of a much greater variety of chunks to support all the animation features that it provides. Images to be used in the animation are stored in the MNG file as encapsulated PNG or JNG images. If you want to convert AutoCAD to mng,you will find mng is a supported output format in the software docPrint Document Converter Professional which is a converting software. docPrint Document Converter Professional dynamically converts MS Office 97/2000/XP/2003/2007, WordPerfect, AutoCAD DWG, PostScript, Adobe Acrobat PDF and many other document types to Adobe Acrobat PDF, PostScript, EPS, XPS, PCL, JPEG, TIFF, PNG, PCX, EMF, WMF, GIF, TGA, PIC, PCD and BMP etc formats. It works in both GUI version and Command Line version. With docPrint Document Converter Professional you can convert your documents from and to 50+ formats easily. Three applications are available in docPrint Pro—GUI application, command line application and virtual printer which contains two printers, one is docPrint to be introduced in this article ,the other one is docPrint PDF driver. The functions of the three applications are the same, but the operations are different. It is up to you to choose which one to use. But you will see how to convert AutoCAD to mng format file with the virtual printer docPrint in this article. First you should download docPrint Pro at http://www.verypdf.com/artprint/docprint_pro_setup.exe and install it in your computer. The setup steps are easy enough, you just need to do everything by following the setup prompts. 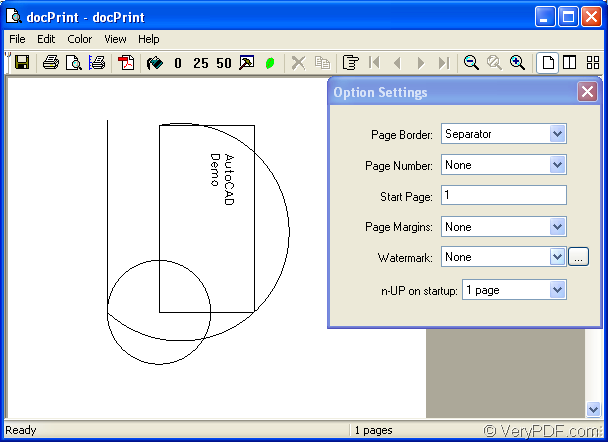 If you have set docPrint as the default printer in your computer, you can run the printer by right clicking the dwg file and clicking “Plot” option and you will see “docPrint” dialog box pop up. If not, please open the dwg file by double clicking or right clicking and choosing “Open” option. You should click “File” and click “Plot” option to open “Plot-model” dialog box. Or the hot key “Ctrl”+ “P” can also realize the same function.Then in popup “Plot-model” dialog box, you should select current printer as “docPrint” in “Name” combo box. Then click “OK” button. If you want to convert AutoCAD to mng format file only without adding any settings, you don’t need to care about the function icons in the toolbar of “docPrint” dialog box showed in Figure1. 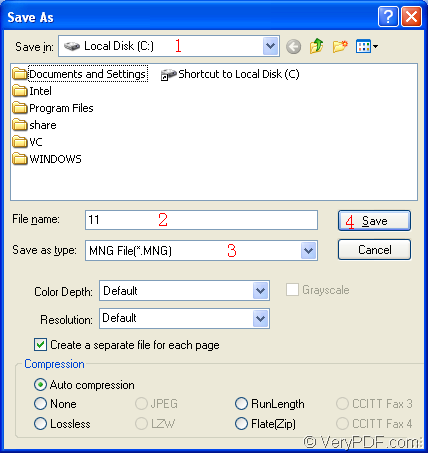 You should choose one of the following method to open “Save As” dialog box in which you can set the changes to the target file. Please click “File” and click “Save as” option in dropdown list, which is the most regular way. You can save files like this in any operations. You can also click the saving icon in the toolbar. Or the hot key “Ctrl”+ “S” is a very good idea. You can choose anyone to open “Save as” dialog box showed in Figure2. In “Save As” dialog box, you just need to care about the four boxes marked in Figure2 from 1 to 4. The first one is “Save in” combo box in which you should choose the location for the target file. The second one is “File name” edit box in which you can input or edit the name of target file. 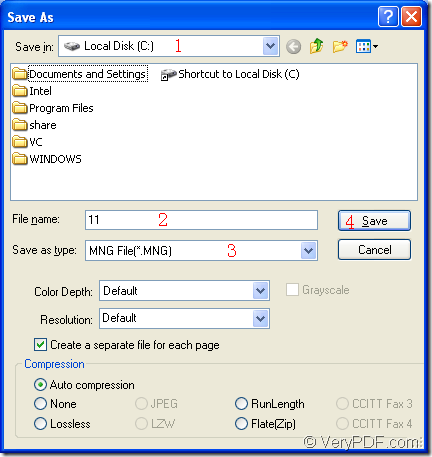 The third one is “Save as type” combo box in which you should specify the output format for the target file, while the last one is the “Save” button by clicking which you can run the conversion and save your target file. After clicking on “Save” button, please wait for several seconds and you will find your target file in the specified location which is set just now. If you still have some questions about docPrint Pro, you can visit the www.verypdf.com or http://www.verypdf.com/artprint/index.html. 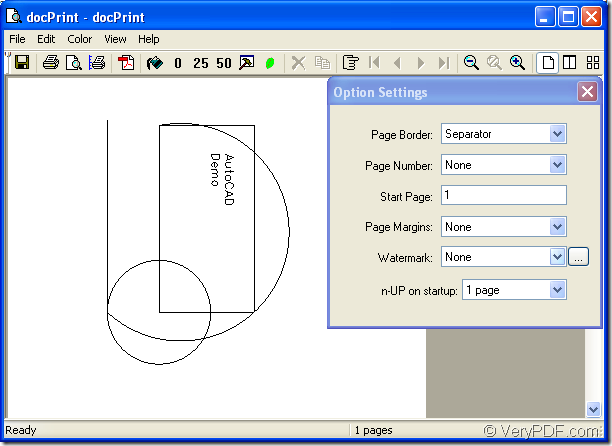 If you want to know more functions about docPrint Pro, you can read its user manual at http://www.verypdf.com/artprint/document-converter/help.htm. How to convert PCL to bitmap and set page orientation? How to convert the 3rd page of pdf to png? How to convert documents of HTML to PCD?